(Nanowerk News) Novel nanomaterials developed at Rensselaer Polytechnic Institute are scheduled to blast off into orbit on November 16 aboard Space Shuttle Atlantis. The project, funded by the U.S. Air Force Multi University Research Initiative (MURI), seeks to test the performance of the new nanocomposites in orbit. Space Shuttle Atlantis will carry the samples to the International Space Station (ISS). The materials will then be mounted to the station’s outer hull in a Passive Experiment Carrier (PEC), and exposed to the rigors of space. Rensselaer professors Linda Schadler, of the Department of Materials Science and Engineering, and Thierry Blanchet, of the Department of Mechanical, Aerospace, and Nuclear Engineering, worked with a team of researchers from the University of Florida to develop two different types of experimental nanomaterials. The MURI project and the University of Florida research team are led by Rensselaer alumnus W. Greg Sawyer ’99, who earned his bachelor’s, master’s, and doctoral degrees from Rensselaer and is now the N. C. Ebaugh Professor of Mechanical and Aerospace Engineering at the University of Florida. Blanchet was Sawyer’s doctoral adviser. Space Shuttle Atlantis will next week carry a new Rensselaer nanomaterials experiment to the International Space Station. 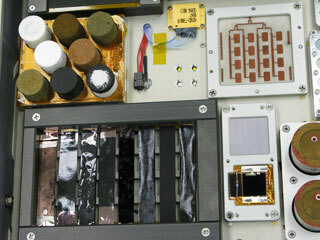 Samples of novel nanocomposite materials, seen in the photo, will be mounted to the hull of the space station, and tested to see how they weather the perils of space. The first new material is a wear-resistant, low-friction nanocomposite, created by mixing nanoscale alumina particles with polytetrafluoroethylene (PTFE), which is known commercially as Teflon. Schadler and her research group introduced different fluorine-coated nanoparticles into conventional PTFE. The small amount of additive caused the wear rate of the PTFE to drop by four orders of magnitude, without affecting the PTFE’s coefficient of friction. The end result is a stronger, more durable PTFE that is almost as nonstick and slippery as untreated PTFE. The gained benefit, Schadler said, is the difference between PTFE that can survive sliding along a surface for a few kilometers before wearing away, and a nanocomposite that could slide across a surface for more than 100,000 kilometers before wearing away. PTFE is often used to coat the surface of moving parts in different devices. The less friction on the surface of these moving parts, the less energy is required to move the parts, Schadler said. Affixed to the station, which travels at about 27,700 kph, the nanocomposite sample will be exposed to ultraviolet radiation, and temperatures ranging from -40 degrees to 60 degrees Celsius. The nanocomposite will be mounted on a tribometer, developed by Sawyer, which will measure the friction of the material’s surface. A control sample of the material, protected in a vacuum chamber in the PEC, will also be tested. The apparatus will send data in real-time to the ISS laboratory, which in turn will be forwarded to the research team. The second set of nanomaterials to be launched into space are conductive polymer nanocomposites. During the loading of the tribometers into the PEC for space travel, an opportunity arose to also test the conductivity of carbon nanotube-filled polyamideimide and liquid crystalline polymers as a function of space exposure. The conductive composites, developed by Schadler and former Rensselaer postdoctoral researcher Justin Bult – who is now a researcher at the U.S. Department of Energy National Renewable Energy Laboratory — had to be developed in less than a week. Blanchet said he’s very pleased, but not surprised, at the success of his former student, Sawyer, in leading this space-bound research study. Schadler and Blanchet’s nanocomposites experiments are the second Rensselaer project to launch into space this year. In August, an experimental heat transfer system designed by Rensselaer professors Joel Plawsky and Peter Wayner was carried to the ISS aboard Space Shuttle Discovery. The project, called the Constrained Vapor Bubble (CVB), will remain installed in the ISS for up to three years. The experiment could yield important fundamental insights into the nature of heat and mass transfer operations that involve a phase change, such as evaporation, condensation, and boiling, as well as engineering data that could lead to the development of new cooling systems for spacecraft and electronics devices.